Assadollah Assadi, the Iranian regime diplomat and the mastermind behind the terror plot to bomb Free Iran gathering. 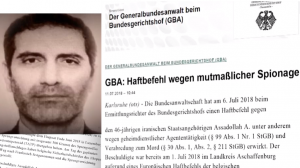 On Wednesday, July 11th, the German Federal Prosecutor announced that its judiciary had ordered the arrest of Assadollah Assadi, an Iranian regime diplomat, on charges of espionage and conspiracy to commit murder. Assadi was previously arrested on July 1st on a European warrant by German authorities near the city of Aschaffenburg on suspicion of aiding terrorists. According to the statement, Assadi commissioned a terrorist attack on the Free Iran gathering in France on June 30th. He assigned a couple in Antwerp in March 2018 to carry out the attack and gave them 500 grams of the explosive TATP in Luxemburg in late June. 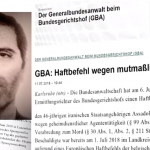 The statement noted that Assadi was a member of Iran’s Ministry of Intelligence and Security (MOIS), whose primary tasks “include the intensive observation and combating of opposition groups inside and outside of Iran.” The German Prosecutor’s statement added that its judiciary warrant would not hinder the request from Belgium for Assadi’s extradition. The couple who was arrested in Belgium for attempting to carry out the attack was previously described by Belgian authorities as members of a regime sleeper cell that had been under the direction of Assadi for years (De Standaard- July 4th). A Belgian judicial spokesman was quoted as saying, “Practically all employees of Iranian embassies are part of the Iranian Secret Service.” (NBCnews.com- July 6th). Reliable sources inside the regime say that the regime’s Supreme Leader, President, Foreign and Intelligence Ministers, Secretary of the Supreme National Security Council, the Revolutionary Guards, the Quds Force, the IRGC’s Intelligence Organization, and the Deputy for Political-Security Affairs at Khamenei’s office planned the attack months ago. The MOIS was tasked with carrying out the operation, with Assadi heading up the terrorist planning in his role as MOIS station chief in Austria. Assadi’s chief responsibility as a regime diplomat in Vienna, working under the guise of Third Counselor, was espionage and conspiracy against the MEK. He has used his diplomatic status to travel to a number of European countries to achieve this goal. The regime is seeking to have Assadi extradited to Austria and ultimately to Iran in order to evade responsibility for his actions. The regime has attempted to deny the plot entirely as well, with Iranian regime Foreign Minister Mohammad Javad Zarif describing the investigation as a false flag plot. The regime’s flimsy denial, paired with its desperate attempts to extradite Assadi show that it is gravely concerned about the situation. Assadi has been stripped of his diplomatic immunity. Mayor Rudy Giuliani, former mayor of New York City and an advisor to U.S. President Donald Trump, issued a statement on this highly sensitive subject.